The new year started out right - at least in terms of yoga. Three classes in four days. Sometimes with yoga, I go all or nothing. I try for three classes per week, four if I'm motivated. But usually it is not three in four days. The first class, on NYD was a 90 minute one. And 90 degrees. Granted, when I signed up for it, I noticed the instructor and I'd only been in his 75 minute class, so I assumed it was only 75 minutes. I know you're thinking that another 15 minutes isn't that big of a deal, but it kind of is. Geoff is a wicked instructor. He pushes a bit, and not hard on the eyes. Mostly because of his form. 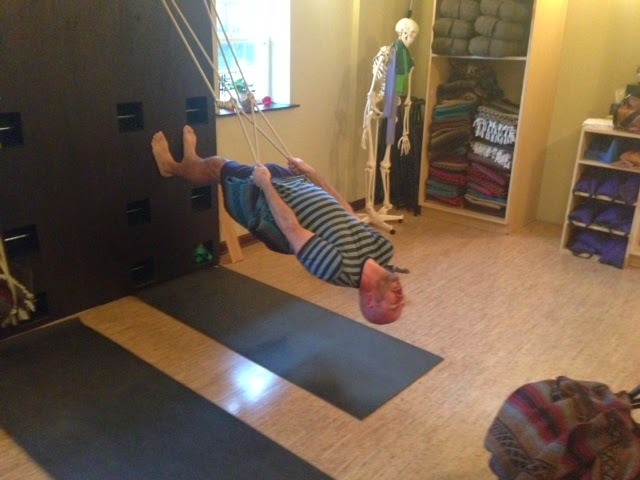 While your practice is your own - and allegedly no wrong way of doing it (though they always readjust me, basically to tell me I'm not doing it correctly). Geoff has the most perfect form in most poses. I've actually stopped my own practice to watch in awe. Still - we made it through that class and were back two days later. Saturday is normally our Geoff day, but I think I also speak for David when I say, I couldn't walk into his practice space again so soon after that last one. So on Saturday, we did a ropes class. Or jungle class. 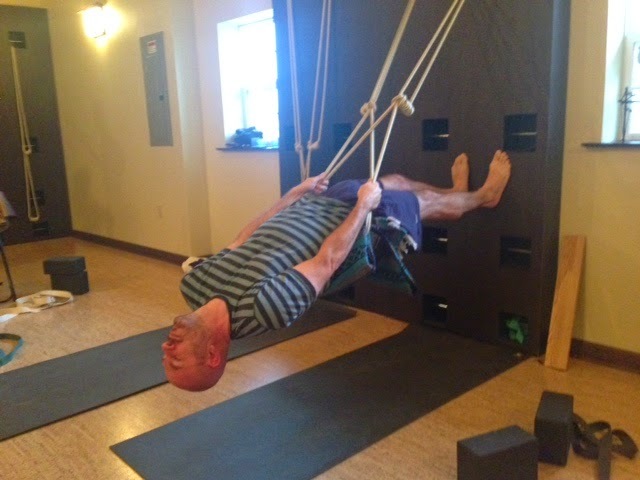 It is about three-quarters of a normal flow and stretching class and the last quarter you pretty much hang from ropes. I thought it was all very Inception-y, but David hit the nail on the head that it is more like the original movie, Coma (I didn't even know there was a remake). Oddly, here it looks like I'm grimacing, but I'm laughing - mostly at / for David - it's just that I'm upside down. The actuality is, inside I was grimacing. The ropes are thick and I have boney hips and the rope digs into them. While you can't really see it, I have a blanket on my backside and over my hips, and that still doesn't relieve the pain. The studio owner told me the next day that I probably need to use two blankets. Bother. The point of the ropes is to get one deeper into their stretch. 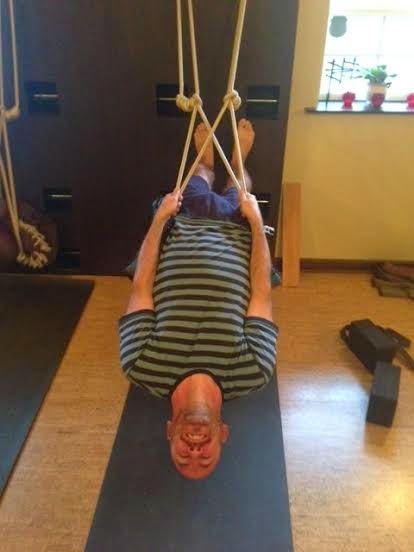 This last time we worked on our upper back, which are not as pliable as the lower. At one point, there were folding chairs under our shoulder blades and we hung over the chairs. I don't think either David or I enjoyed that, mostly because the exercise - dare I say it - was built more for the stature of a women and not people who stand 6'2" - 6'4". Neither of us could get our leg placement right, and if we did, the chair was then unstable. Still, it was something different. At least I can say that. I did my first group class last night. I've been in private sessions since last spring twice a week. I enjoyed the class setting a lot even if I was the only male. However I am awake at 12:15 am with back pain. I went to bed at 9 pm (usual time) but cannot sleep. So I will see but I obviously did something that does not agree with my body. Maybe I really do belong in private sessions.